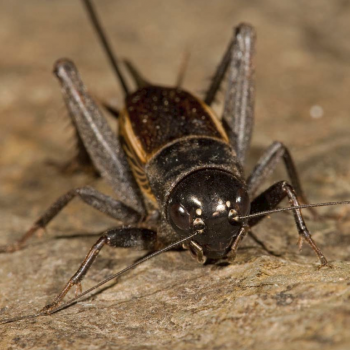 Song of a Fall Field Cricket (scroll down for explanation and additional recordings!). The Spring and Fall Field Crickets look and sound the same — they are large, black, and round-headed, and their song is the quintessential cricket chirp. The two species were once thought to be the same, but scientific studies revealed that there are indeed two different species that are morphologically almost identical, but developmentally different – Fall Field Crickets overwinter as eggs and Spring Field Crickets as nymphs. In areas where both species are found, they are best identified by when they are seen or heard. Because they overwinter as nymphs, Spring Field Crickets develop quickly when warm weather arrives and adults typically appear and begin singing and mating in late spring, continuing until late June or early July, when they finish laying eggs and die off. In contrast, Fall Field Crickets hatch in the spring, and adults don’t appear and begin singing until mid- or late July, after which they continue singing and mating into the autumn, when they are finally killed by frosts. In most areas of overlap, there is a period of silence in midsummer when neither species is heard. Both species are found in a wide variety of habitats, and are common around buildings where they hide in cracks and crevices, under rocks, or in shallow burrows. As winter approaches, Fall Field Crickets are attracted to heat and often find their way into houses or other buildings. Song: The song of both species is a series of clear, loud chirps given at a rate of about one per second (or faster). Each chirp is actually a brief trill consisting of 3–5 pulses, given too fast for the human ear to detect. The frequency of the song is approximately 4–5 kHz, depending on the ambient temperature. Field crickets chirp both day and night from their hideouts, but are typically quiet at dawn. Sonogram movie of a chirping Fall Field Cricket. Note that each chirp is actually a brief trill. Tree crickets can be heard trilling continuously in the background. Calling song is followed by courtship song. © Wil Hershberger. In worldwide clinical valtrex get you high trials of Lopressor in myocardial infarction where..